Home Buying can be an incredibly scary and stressful experience. You may not know where to turn for advice. Friends and family may mean well but they aren’t experts and the internet may seem as though it’s full of useful information, but it can be very unreliable. We encourage you to come out and hear what professionals have to say about one of the most important decisions of your life. Our goal is to supply you with ample knowledge while also allaying your fears about the process of securing a new home. We will be discussing the different types of mortgages and explain the mortgage process in detail. We will also help you assess what you can afford as well as other basics that you need to know. Specifically, if this is your first time buying a house. 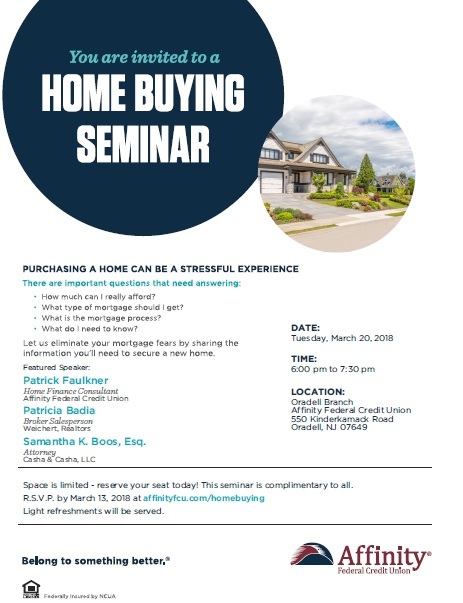 Please join Casha & Casha Real Estate Attorney Samantha K. Boos, Esquire, Home Finance Consultant Patrick Faulkner, and Broker Salesperson Patricia Badia on Tuesday, March 20, 2018, from 6:00 pm to 7:30 pm at the Oradell Branch of Affinity Federal Credit Union located at 550 Kinderkamack Road, Oradell, NJ 07649. Space is limited- reserve your seat today! Light refreshments will also be served. No one should be afraid to talk to a lawyer. Contact us today for a FREE, no obligation consultation. Medicaid is excluded from this option. For almost 40 years, Casha & Casha, LLC has been dedicated to clients, both small and large. We have helped local clients, as well as clients in Europe, Asia, and South America to achieve their goals.